Until I can say for certain that this new set will be warm enough for the harshest days and nights of a Montreal winter! What's the use of winter apparel if they won't work under most conditions? I don't want to have ten different winter hats for various weather conditions. Two would be plenty enough. I'll test them outside starting today! All the loose fur hair produced during the cutting and trimming are well worth it! Synthetic fur, scraps of polar fleece, re-used plastic safety eyes (this is its third assigned hat), lots of sewing! I trimmed the fur on the "face", to define the eyes, and also at the border, to avoid fur in my own eyes. The hat itself is an evolution from one I made last year (or was it the year before? ), from a dirty brown fur coat. The old model had been dropped because it was too short, too brown, and didn't protect my ears enough. The new one is so comfortable I've had it on my head for about 20 minutes, indoors. I've made three hats and three pairs of gloves this winter. 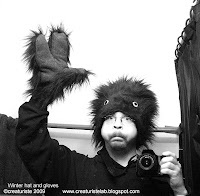 The first pair of gloves (same fur, but palm was black) was a bit tight-fitting, but I could have lived with it. Then they got stolen. So I made a second pair. Those were better looking, but uneven and also a bit tight, despite adjustments to my pattern. It was the difference in materials that made it so (much thicker fake fur). So I made the third and current pair, featured on the picture (same thinner fur as first pair). The new pattern is much wider on each finger, and will probably fit most materials. I learned a lot about pattern making for clothes while making these work. Especially about enlarging the size on the outside, so as not to disturb the fork between finger groups. I think it's the same with pants. I've never had to widen the pants I patterned because they were all kind of loose, so I'll keep an eye on it for the future. I also made a "tube scarf" (not pictured here) which is a simple double-layered piece of polar fleece, sewn as a loop. It's stretchy, so I can just slip it on and it stays put. Thanks to Hobey (on Puptcrit), for the suggestion! If I had enough polar fleece in another color than bright orange, I'd make long johns to wear underneath my pants! Some winter, I'll be toasty warm. Not thanks to the clothes, but because I'll have moved someplace warm where winter doesn't have a grip!